Kurt Michaelson: Do Mormons and Evangelical Christians Share the Same Biblical Theology? Do Mormons and Evangelical Christians Share the Same Biblical Theology? A few months ago, I was asked by the women who lead the Women's Growth Group class at our church, to give a brief overview of a few of the world religions and how they compare to Christianity. Last week, I taught about Islam, which was very interesting to read about and to listen to various sermons throughout the week regarding Islam. The Mahdi will be a messianic figure. He will be a descendant of Mohammed. He will be an unparalleled, unequaled leader. He will come out of a crisis of turmoil. He will take control of the world. He will establish a new world order. He will destroy all who resist him. He will invade many nations. He will make a seven-year peace treaty with the Jews. He will conquer Israel and massacre the Jews. He will establish Islamic world headquarters at Jerusalem. He will rule for seven years, establish Islam as the only religion. He will come on a white horse with supernatural power. He will be loved by all people on earth. I would highly recommend listening to this sermon too. This past Sunday, our topic was about Mormonism. I think this outline of my notes will provide some benefit to those that read this post concerning Mormonism whenever they see a pair of guys wearing the traditional white shirt, black tie, black slacks and name badge on the left breast of their shirt, coming to bring the Good News of Jesus Christ, they may be able to more informed regarding what Mormons actually believe. Hopefully, after reading through this and maybe even picking up a book from your local library about Mormonism, you'll realize that Mormons do not believe in the same Jesus Christ that is found in the Bible. After reading the article at Christianpost.com, Romney 'Obviously Not a Christian,' Fox News Host Says, I hope this brief bit of information about Mormonism could be helpful. Please go to www.carm.org/mormonism where you will learn a lot more about Mormonism, so here we go. September 21, 1823 – An angel named Moroni appeard to him one night while praying and Moroni told Smith of a collection of golden plates containing an abridged religious history engraved many centuries earlier by Moroni and his father Mormon. The next day, he was instructed by Moroni where to go and find these golden plates that were buried under a round stone, on a hill in Manchester. When the golden plates were translated, they were translated as a result of a “feeling-state” rather than a literal translation from its foreign language into English. ==>>Basically, he guessed. Sadly, Joseph Smith was assassinated in 1844 by an angry mob in Nauvoo, Illinois. Why is Mormonism So Appealing? Because, “God has spoken again and Joseph Smith is his prophet…” Sound a little bit like Islam? 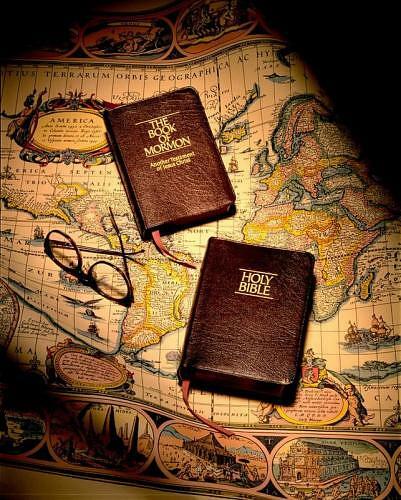 The KJV Bible - Mormons accept the KJV, "as far as it has been correctly translated"
The First Presidency letter of the LDS stated that the most reliable way to measure the accuracy of any biblical passage is not to compare it with another passage from the Bible, but to compare it with the Book of Mormon. The LDS Doctrine and Covenant 73:4 states that God commanded Joseph Smith to finish a new translationof the Bible, known as the Inspired Version or the Joseph Smith Translation (JST). Joseph Smith merely edited or revised whatever he felt was necessary according to his view at the time. He added the prophecy of his own birth in the Mormon KJV in Genesis 50:33 - The very last verse of Genesis 50 is verse 26. The insertion of Joseph Smith's prophecy of his birth is exactly that, his insertion and verses 27 -33 are nowhere to be found in any ancient Hebrew manuscripts. With one "Special Revelation" the Mormon Chruch expects its intended converts to accept the totally unsupported testimony of a fifteen-year-old boy that nobody ever preached Jesus Christ's gospel from the close of the Apostolic age until the "Restoration" through Joseph Smith Jr., beginning in 1820! We are asked to believe that the Church Fathers for the first five centuries did not proclaim the true gospel - that Origen, Justin, Iraneaus, Jerome, Eusebius, Athanasius, Chrysostom, and then later Thomas Aquinas, Huss, Luther, Calvin, Zwingli, Tyndayle, Wycliffe, Knox, Wesley, Whitefield, and a vast army of faithful servants of Jesus Christ all failed where Joseph Smith Jr., was to succeed! With one dogmatic assertion, Joseph pronounced everybody wrong, all Christian theology an abomination, and all profession Christians corrupt - all in the name of God! How strange for this to be presented as resorted Christiantity, when Jesus Christ specifically promised that "the gates of Hell" would not prevail against the Church (Matthew 16:18)! In Mormonism we find God contradicting this statement in a vision to Joseph Smith Jr., some 18 centuries later! (The Maze of Mormonism, 1978, p. 31). Mormonism teaches that God was once a man, having been created by another god, but by self-perfection, this man finally evolved into absolute godhood. Ephesians 2:8-9 - For by grace you have been saved through faith, and that not of yourselves; it is the gift of God, not of works, lest anyone should boast. Joseph Fielding Smith said that those who believed in the “faith alone” doctrine were damned. Throughout the Bible there is only one way of salvation that is taught and that is through faith alone in Jesus Christ. The Apostle Paul never taught salvation was earned by good works and personal righteousness, as Mormons claim. (They refer to Romans 4:3, For what does the Scripture say? “Abraham believed God, and it was accounted to him for righteousness.”) When Abraham went to the mountain to sacrifice his son Isaac. A question to ask any Mormon that confronts you is, if salvation is by good orks and individual merit, what then does the atonement of Christ accomplish? Just as a college degree does not secure a salary but only makes earning one possible, so Christ’s death does not secure salvation but only makes it possible to earn it by good works. Mormon faith and Christian faith are not the same. Mormonism rejects and opposes the Bible’s clear teaching about: God, Jesus Christ, salvation, the death of Christ and more. Mormonism denies the teaching of the Bible itself and on man, faith, the Fall, death and the afterlife, the Holy Spirit and several other important and critical doctrines. Anyone that claims that Mormons and Christians are brothers and sisters in Christ are flat out wrong. Clearly, Joel is wrong, according to the Scriptures. So, would people like presidential candidates Mitt Romney (former Gov., R-MA) and Jon Huntsman (Gov., R-UT), Glenn Beck, Senators Orrin Hatch (R-UT) and Harry Reid (D-NV) be considered Christians, if these are the things they doctrinally believe? I don't believe they are, if they do not believe in the sufficiency, inerrancy and the authority of Scripture. Ephesians 2:8-9 is a key verse - For by grace you have been saved through faith, and that not of yourselves; it is the gift of God, not of works, lest anyone should boast. Please feel free to share this with others too. Thanks for posting this, Kurt. I have a friend that left the Mormon church after being in it for 37 years. Someone told him to check out The View of The Hebrews by Ethan Smith. It was written before the Book of Mormon and has Many parralels with it. Your post has great information. God Bless ! Thanks Scott. I used the book by John Ankerberg (cited as an additional resource) and the Christian Apologetics & Research Ministry are very helpful too. Hopefully, the information that I've shared will be helpful for other Mormons to come to a true understanding of the Christ of the Bible and not a modified version of Him. Thanks for stopping by to read the post.